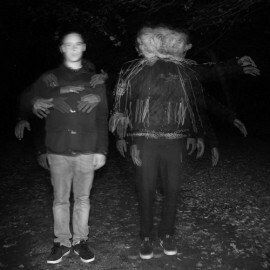 Mystic State (Will Marquiss & Mike Holliday) are a duo based in the South­west of England. After producing separately for around 3 years respectively, they decided to combine ideas and release music under a new alias. Heavily influenced by producers and artists in the experimental and deep drum and bass scene, as well as producers in other genres, they are bringing a new flavour on modern drum and bass. While 170 is generally their chosen tempo, the duo also like to show their versatile side and branch out into other genres such as techno, hip­hop and dubstep, but still manage to put their own individual style into each production. The pair plan on keeping the old­school drum and bass vibes that influenced them to start producing, whilst still moving the scene forward and drawing ideas from modern electronic music. The duo are also enthusiastic DJ’s, and have been mixing for around 6 years. They are both strong vinyl collectors, but have recently moved on to CDJ’s to keep with the current club scene, and also for the benefit of playing out their own music. 1. If you could remix one track, what would it be? It would have to be Die & Break - Get Some. Stone cold classic. Sat with a beer and a pizza in the sun, maybe even making a bit of music! 1200’s…. haha. Ours are a little worn out now but can’t beat mixing on turntables.